Achieve enviable shine with the Gloss and Vibrance Conditioner from MÁDARA. 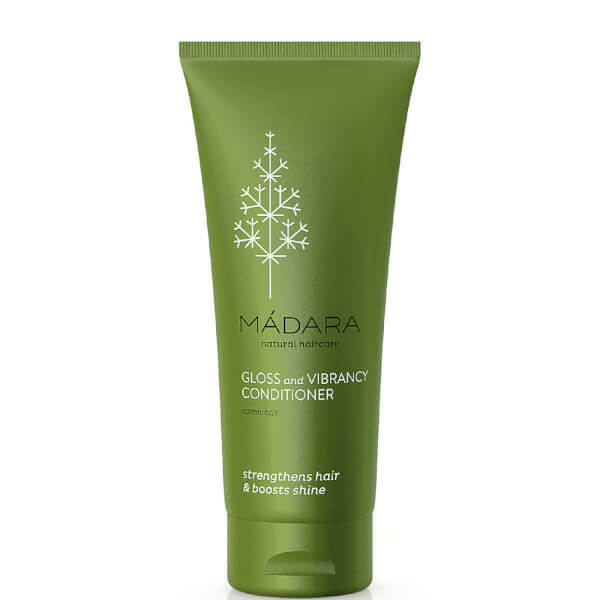 The luxurious conditioner works to leave locks in tip top condition, preventing dry ends and enhancing gloss. Enriched with Northern Birch and Cranberry, the rich formula provides nourishment and strength to the fiber. The scalp is left feeling calm whilst the hair is left visibly silky smooth, with improved manageability. The conditioner is packaged in a 60% post-consumer recycled tube to reduce the volume of new plastic packaging being made each year. Apply to clean, wet hair. Leave in for 1-3 min, rinse thoroughly. For best results use with Madara Gloss and Vibrancy Shampoo. Aqua, Cetearyl Alcohol Distearylethyl Dimonium Chloride, Betaine Glycerin***, D-panthenol (Provitamin B5), Betula Alba (Birch) Leaf Extract*, Lactic Acid, Vaccinium Macrocarpon (Cranberry) Fruit Extract*, Hydrolyzed Wheat Protein, CI 77019 (Mica)****, CI 77891 (Titanium Dioxide)****, Benzyl Alcohol, Potassium Sorbate, Sodium Benzoate, Aroma**, Limonene**.